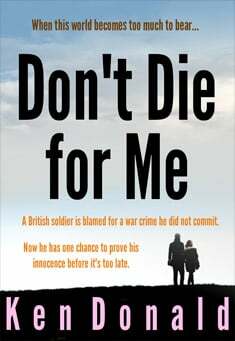 Blamed for the deaths of innocent Afghan villagers, Sergeant Jim Balham returns home a broken man. Tortured by guilt, and the nightmare of what he has witnessed, he chooses suicide as his only means of escape. Katie Williams - a shy, intelligent woman, abused by her husband - discovers Balham close to death and saves his life. Drawn together by an irresistible attraction, they vow to prove Balham's innocence, and find those responsible for the tragedy that has haunted him for so long. When they threaten to expose a cover-up that goes right to the heart of government, sinister forces are determined to stop them. Can they discover the truth of what really happened before it's too late? As Jim Balham reached for a beer, his hand froze in mid-air. He left the bottle of lager on the shelf and straightened up, idly closing the refrigerator door. He had made a decision. Today would be the day when the torture ended. He returned to the bedroom and donned his walking gear, not really caring if he disturbed Trudi, before making his way to the garage, where he retrieved his rucksack, loaded with the items he would need for the task he was about to perform. It was six a.m., and as he made his way through the village to the path that led up to the forest, he met no one. Ranton was deserted. It was always deserted. That was why he had chosen it as a place to live. Since returning from his second tour of Afghanistan, he could not exist with the noise and bustle of the city. Trudi hated the place. But then again, Trudi seemed to hate everything lately. Especially him. It took him thirty minutes to reach the spot in the wood that he had chosen months before to serve his purpose. He placed his rucksack on the forest floor and opened it. It contained two items - an exceptionally sharp knife with a rubber-coated handle, thus ensuring the user could always maintain a firm grip, and a length of rope, fashioned into a noose. He had previously searched on his laptop to find the correct way to create the deadly apparatus, and it had been one of the few times in the last month that he'd actually smiled. You can find out everything on the Internet to make life easier, he'd thought - even how to end it all. And now he had a dilemma. What method should he choose? Knife or noose? He opted for the noose. Hopefully it would be a cleaner death. He tied it to the sturdy, overhanging branch he had chosen for the job, and dragged a fallen log on which he would climb, to give him sufficient height to be able to wrap the rope around his neck. So, everything was prepared. He would just sit down for a few moments and have one final cigarette. A condemned man's last request, he thought. This time he didn't smile. As he drew the smoke into his lungs, he let his mind wander. But it always returned to its default setting - memories of the time he returned to Afghanistan . . . Naturally, Trudi didn't want him to go back for a second tour. It had only been three months since they'd lost the baby. But, if he was completely honest, he couldn't get back into the thick of the fight quickly enough. He'd wallowed in self-pity long enough, and he needed the adrenaline and the danger to help him forget. To help numb the pain. "What about me? What the **** am I supposed to do while you go off playing war?" He knew that Trudi was trying to goad him, to belittle the path he had chosen. He couldn't blame her. She hated the army. She'd got pregnant because that was what he'd wanted, and, as soon as everything had gone wrong, he was deserting her. She had a right to hate him, and the army. Unfortunately, this time Afghanistan had changed. The people seemed to resent his presence. Except for Azita. When they patrolled her village, she had taken a shine to him, and she smiled and hugged his leg. She was such a joyful little thing, she somehow raised his spirits, and he instinctively searched his pocket for the small teddy bear he always carried with him, as a reminder of the daughter he'd lost. Azita accepted it with squeals of delight, and she ran off to show her mother. The woman simply scowled at him, and a leaden feeling returned to the pit of his stomach. The patrol returned to the village several times over the next few weeks, and Azita was always there, giggling and clutching the little bear - her new treasured possession. Whenever he saw her, he removed his helmet and smiled at her, ignoring the frowns of the other villagers. But he didn't care what they thought of him. Azita's joyful, innocent smile was the only thing keeping him sane.